An invaluable manual for beginners and experts alike. 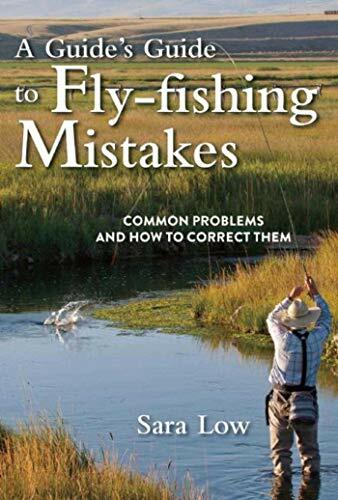 A licensed fly-fishing guide’s observations on the common mistakes made by anglers, A Guide’s Guide to Fly-Fishing Mistakes provides practical tips on how to improve fly-fishing techniques and break bad habits. Licensed fishing guide and instructor Sara Low offers remedies to freshwater anglers on topics that include correctly approaching fish, improving fly selection, proper presentation, consistent and accurate casting, and efficient hooking and landing of fish, as well as pointers for fishing in spring, summer, fall, and winter. Although written for anglers with experience, the notes will be just as helpful to anglers who have not had time to develop bad habits. Low elaborates on how to fix the mistakes many experienced fly-fishers make. Supplementing her methods are tales that illustrate different mistakes made on the water with her suggested correction for each mistake. Taking these suggestions to heart will provide you with that ah-ha!” moment you’ve been waiting for. As a guide, Low sees the same mistakes being made over and over again. Now you can see them too with this must-have resource. More fish, bigger fish, better fishwhatever the goal, the experienced and novice angler will find meaningful advice for greater fishing success.